The beginning of August, Jer, Isla June, Bixby (the dog) and I traveled up to Ohio to spend a week with Jer's family. 9 cousins, 14 aunts/uncles when you include all of the inlaws. Crazy stuff (see family photo here). Beautiful view. I loved waking up to this every morning and watching the sunset every night. 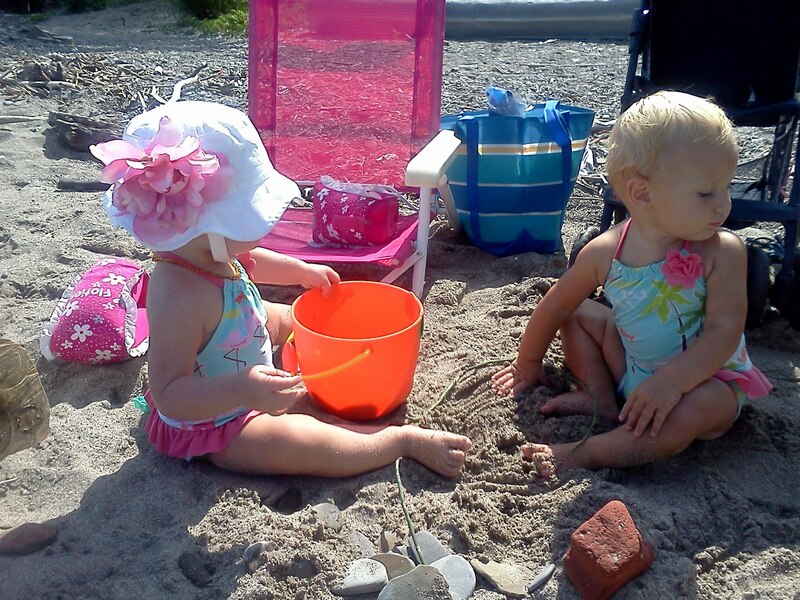 Isla June and cousin Sara Jane (who's 1 months younger) had such a good time playing in the sand together (in the same bathing suits! not on purpose). Sara even started to say "I-la" while we were there. too cute. 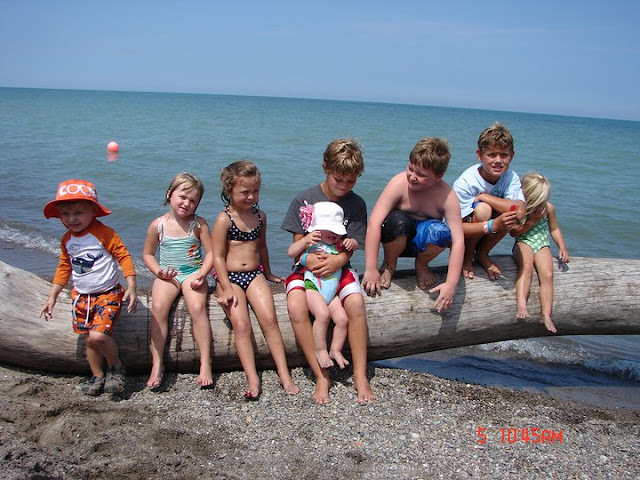 8 of the 9 cousins (Sara Jane was napping). 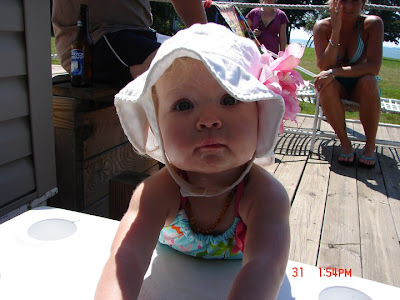 Isla June did not like her cousins holding her for pictures. oh well, could have been cute. 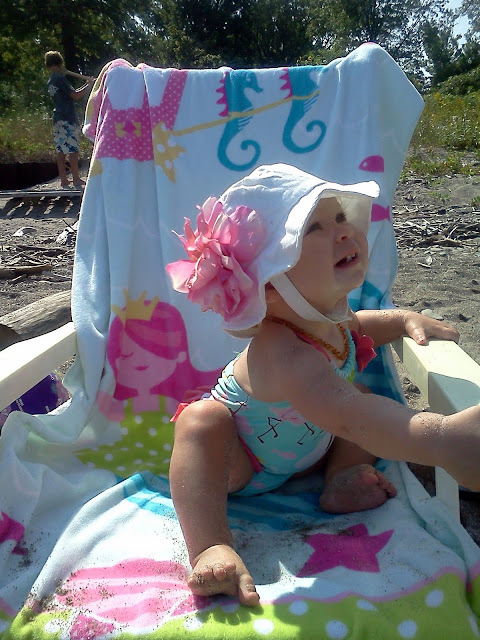 We had to use the cloth/reusable swim diapers because Isla June got such bad diaper rash on the first day from the disposable huggies swim diapers. I only got peed on once. yay. Cousin Aidan was SO good with Isla June. Patient, kept an eye on her, listened (and was ok with it) when I told him we had to be quiet because she was sleeping. I can totally see him being an older brother figure to her. Isla June had such a good time with all of her cousins. She would huuuuug Molly and Annalise every morning. It was too wonderful. I will say, by the end of the week, 7 (and sometimes 9) children running around was a bit crazy! Made me appreciate just having 1 for right now. But all of the craziness was totally worth it. Living so far away from everyone, Jer and I sometimes worry that our nieces and nephews forget who we are. Trips like this are a great way to reconnect and remember the bond that we all will always have with one another.